Mykhailo Horlovy is an accomplished sculptor who is the author of monumental works in granite and in bronze (in Ukraine and abroad). These include monuments to Ukraine?s hetman Ivan Vyhovsky and pioneering archeologist Vikentii Khvoika, who was the first to study the Trypillian civilization in Ukraine. He is also co-author of the monument to the well-known Ukrainian writer Ulas Samchuk in Rivne. Mykhailo Horlovy has also authored numerous memorial plaques. He has participated in numerous exhibits and competitions, in Ukraine and abroad, in which he has won awards and received recognition. 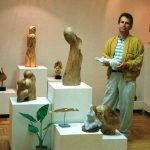 In 1992 he graduated from Ukraine?s National Academy of Arts and Architecture (Faculty of Sculpture). He is a member of both the Union of Artists and Union of Writers of Ukraine. Mykhailo Horlovyi?s works have been influenced by many factors, including artifacts found in the village of his birth, Shcherbanivka (in southern Kyiv oblast), where as a child he played with and gathered broken pieces of Trypilian-era pottery. As a young adult, he became interested in the fate of the Ukrainian language, and began to write poetry. His poetry can be found in several books, including personal collections. A number of Mykhailo Horlovy?s works have been inspired by the ancient and pre-historic Trypilian and Scythian cultures. In addition to prehistoric themes, he is also interested in contemporary forms, and has a considerable number of abstract works. He works with several materials, including stone, clay and wood, as well as in bronze. Mykhailo Horlovy?s works are to be found in private and state collections of Ukraine, Canada, Lebanon, Australia, Spain, France, Austria, Poland and Syria. Pictures of some of his works have appeared in art catalogues and journals.